Thought I'd make a thread of my own! Rivulet: Capture (Buizel, Medium Rank); uncurated (Concise Curation preferred). Aiming to capture Buizel, at the Medium Rank. A Concise Curation would be nice! 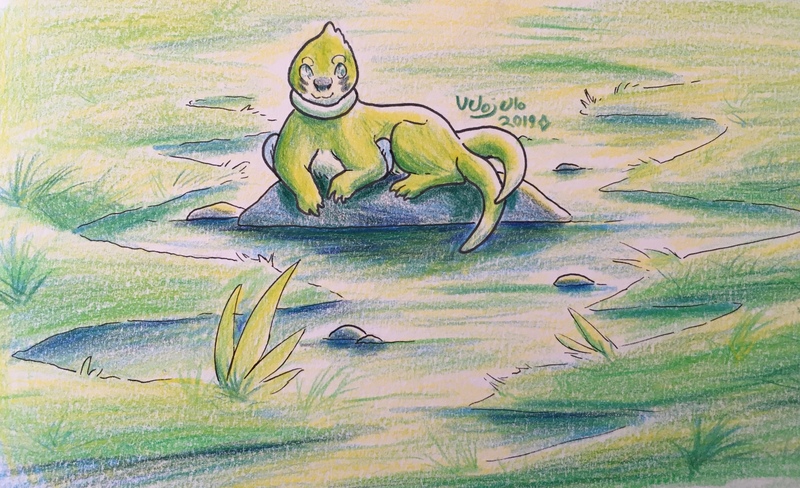 • Utilization of colored pencils is really great; you used the rough gradients provided by the grip of the paper to give the grass some nice texturing, and the marks of the pencil help distinguish the direction Buizel's fur is flowing in as well. • Good color choice; choosing to make Buizel shiny is interesting, as gold and silver aren't usually 'natural colors' to work with where animals / animal forms are concerned, and matching them without being gaudy can sometimes be tricky. Giving the grass yellow and yellow-green tones works around this beautifully, and also mends well with the feeling of a sunrise or sunset the lighting gives off. • Shading; very well positioned and really helps give a sense of direction for the lighting - feels very natural, as if induced by a rising or falling sun across the grass and fur in the scene. The shading of the rock where it meets the water is done in a way that makes it appear as a reflection, which is a wonderful touch. • The river / stream just sort of disappears near the back of the image and the water blends into the grass entirely, making it indistinct where the flow of water is coming from or going. Make sure important features of the background are fully realized in higher ranked works so everything is clear and understandable. • The water itself is a little dull; much of this can be waved away as being a murky creek, but there should be some highlights from where the sunlight is hitting the water - brighter streaks on top of the water itself. You've gotten some of this down by omitting to put color in some spots, and this works, but its muddied by the surrounding colors which makes it easy for the eye to pass over and not notice. Not a big deal, but would make things look slightly more refined in some spots. • Buizel doesn't have much shading around its snout, despite sunlight hitting it from the upper-right of the page, as opposed to straight above. a little more shading to denote the shape would be expected on the left side of its face in this area. You have very clean pencil work and coloring here! The colors blend well and are well matched, and the style of everything goes well together into a cohesive work. The scene itself suggests a fun narrative of Buizel having spent a day playing and now resting after the fact, or perhaps waking up to begin the day frolicking in the stream. The line work is varied, and provides a sense of weight to the Pokemon that grounds it in the scene. You denote finer blades of grass of the banks of the creek with come nice penciled in silhouettes, adding some more depth to the work. Going to say this comfortably passes at Medium Rank, and you have caught Buizel! To take this to Hard, a more complex background where you finish out the back end of the stream and perhaps add more details to the river banks, and a more complicated posing and action would benefit you. Smaller details, like a more clear rendering of light on the water would also add some extra pop to the work. Wonderful art as always Velo! Thanks for baking these clams, Fenris! Totally agree with you on the water/highlights; I need to bite the bullet and test white paint on these pencils already. Claiming Buizel!